These are just a few of the hundreds of testimonials we’ve received from happy students and parents. 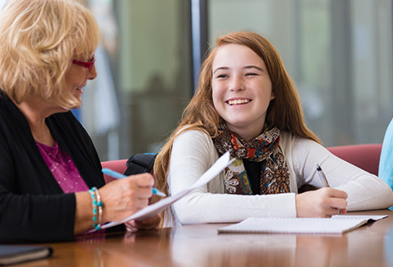 They cover all aspects of English tutoring: reading, writing, contest writing, test prep, college admissions, graduate school admissions, and college classes. You too can succeed in English–contact us today. "I took the test once and scored 720 on the Reading section. When I took the test for a second time, I could tell that the classes had really helped my reading comprehension, even before I received my score. When I got my score, I improved 40 points, from 720 to 760. My family is very happy with the Improve Your English SAT training program!" “Summer program advising helped me make my own decision. In the past, I was indecisive and let others make decisions for me. Now that I am in HS, I know I have to choose my path, not just let my parents choose it for me. Improve Your English College Counseling is helping me make those decisions for myself." “We are very appreciative of your kindness, patience, willingness to listen, and sharing of insights. You give me honest feedback, telling us mistakes to avoid. You listen to our concerns. You don’t take things personally. I really like this kind of interactive, honest, respectful, open dialogue. We really like you. We can build up mutual trust and understanding. We hope you will help our son through the process. For me it is stressful. One of the most important things is trust and I feel we are getting it here. Sometimes I say things that I am uncertain about, and then you talk to me and explain how things really are. This level of trust in a relationship is very important to me." "Hi Nat, I’d like to share with you this good news. Today, Stanley won the 2nd place for his school's Speech Festival. Thank you very much for selecting JFK Inaugural address!" "The classes have been wonderful." "Our son got 36 in his September ACT test. He is very happy. Thank you so much for these years’ teaching them in English! It really has built up their solid English foundation." "Our daughter got straight A's in English, Art History and World History in her first semester at U.C. Riverside. She has been helping other students with their essays and says that the time she spent with Improve Your English tutors has made all the difference." "Improve Your English helped my son make big changes to his college admissions essays. After receiving their help, he was admitted by early action to CalTech and MIT." "Our son is enjoying Pomona very much. Your tutoring formed the basis of his academic skills. We are eternally grateful to you!" "Our middle-school son has worked with Improve Your English for three years. He loves the books, the poems, and the grammar! He says an hour of class goes by much faster than an hour of school." "The tutors at Improve Your English helped my son get admitted to Berkeley. By sharpening his writing skills and learning to develop a persuasive application essay, he presented himself in the strongest possible light to the admissions officers. My wife and I couldn't be happier with Improve Your English." "My son scored 100% on two of his STAR test sections! I've recommended Improve Your English to several of my friends. They too are very happy with your style of tutoring." “With your help, my daughter's reading, writing skill and vocabulary level increase dramatically, and she did very well in her high school entry tests. “As someone who hates standardized testing, I had always thought of the SAT as a pain, a weary obstacle that had to be scaled because there exists a vague thing called "college." But as I prepped for the SAT at Improve Your English, I realized that there was something big, something monumental, occurring in my education. I had always been a "reader," at least by the strict definition of the word. Piling books higher and higher, I had viewed journeys through literature in a purely quantitative sense. I would happily finish a volume and check off another "important" book read. More pages, more miles—this is what reading is all about, right? But during my test prep, I finally learned to read in the imaginative sense. To borrow a Shakespearean phrase, I learned to read with my mind's eye. Every word, every description became a world inside my head. Truly, learning to read and absorb literature in such a manner has fundamentally changed my ways as a student. The text, previously black and white upon printed paper, leapt outwards into my reality. "I am one of the lucky students who studied with you to prepare for the Graduate Record Exam. Now I am working toward my master's degree at Santa Clara University. I am very grateful to Improve Your English in helping me get there!" "Before my daughter started with Improve Your English, her state assessment [on the STAR reading test] was at 900. In less than a year of working with the program, her assessment rose to 1,200 (full score is 1,400). Since starting the program, she has become much more interested in reading English language books. Before coming here, she was only interested in Chinese books. We are very happy with her progress so far."